Yesterday, the Federal Communications Commission took on the real threat facing America: poor people who need to get online. 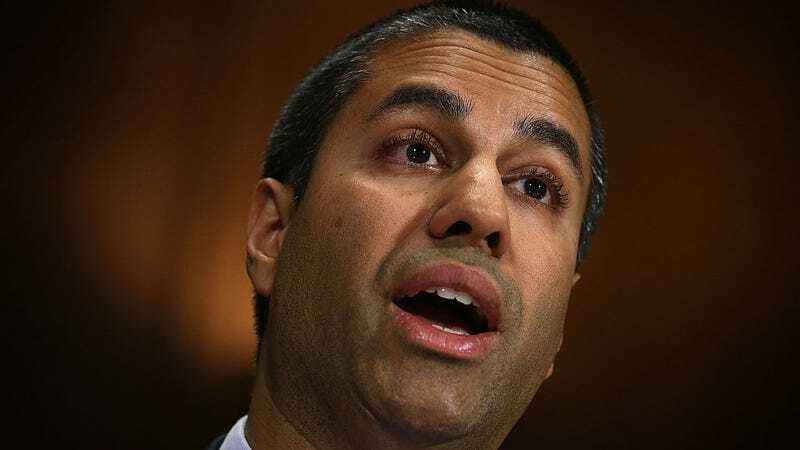 FCC chairman Ajit Pai announced that he would direct the agency to eliminate the federal approval process for broadband providers who want to provide service through the LifeLine program, which administers subsidies for phone and internet service. That means any new broadband provider that wants to participate in the program will need to get approval state-by-state, which experts say will likely be an incredibly long and burdensome process. To make matters a whole lot worse, according to an FCC spokesperson, no states even have an approval process in place for broadband-only providers. Right now, roughly 3.5 million Americans receive subsidized broadband through the program. Last year, under chairman Tom Wheeler, the FCC issued an order that created a streamlined federal approval process for LifeLine broadband providers, meaning a provider could get a single federal approval to get subsidies for service in any state. That order also required LifeLine providers to include broadband service by 2021, and set minimum speeds. Nine providers had already been approved using the federal process, before Pai suspended those approvals earlier this year. Pai argues that eliminating this federal process will “strengthen the Lifeline program and put the implementation of last year’s order on a solid legal footing.” Kicking regulation back to the states is better, he suggests, because they are better at monitoring for waste, fraud, and abuse. But doing this means huge delays for low-income Americans, because providers will have to go state by state to get approval. This will affect children and seniors in particular, who often need subsidized service to help them to get online—and it’s an urgent need. We’ve written before about the lack of physical broadband infrastructure for poor areas, but the cost barrier is huge, too. In 2015, Pew found that one-third of kids in households making below the median income of around $50,000 don’t have access to the internet, compared to 8.4 percent of kids in homes above that number. (Low-income black children are also about 10 percent less likely to have internet access at home than low-income white children.) And although Pew also found that the numbers of poor Americans with access to the internet through smartphones was increasing, the numbers who have home broadband was decreasing, which is a big problem for, say, children who need to do their homework. Gizmodo spoke with Michael Flood, vice president of strategy at Kajeet, one of the nine providers that had their approval revoked. Kajeet provides educational broadband services to 300 school districts across 41 states. It also provides school districts with mobile broadband units, allowing kids who don’t have wifi at home to do their homework, or even work on the bus. Kajeet told Gizmodo that the company was “anticipating that we would be able to serve far more students, tens of thousands of students more in the next 12 months than we were able to serve without the program.” Yesterday’s decision makes that very unlikely. Several people, including Flood, told us no state currently has a regulatory structure in place to approve LifeLine providers for broadband-only service, and an FCC spokesperson confirmed this. Because the FCC created their approval process nationally last year, “the states weren’t really motivated to create it locally,” says Flood, and the broadband subsidy was only added last year. Companies that want to provide subsidized voice services will still be able to get designated as LifeLine providers in the states and then sell broadband services, but any company that just wants to provide broadband—like an educational broadband or cable company—is likely out of luck until each state updates their regulatory mechanisms. That’s generally is the kind of thing that takes forever, and it has to happen in all 50 states. According to Flood, this decision means companies will “simply pick the states that make the most sense,” meaning states with the best regulatory environment, or the most available other subsidies. That leaves kids in other states out of luck. Nicol Turner-Lee, a fellow at the Brookings Institution’s Center for Technology Innovation, says these rules could have a huge impact on these providers. “These aren’t big companies,” she noted, and said it’s going to be tough for these providers to go to state-by-state and get approval. It could take months or years. And that matters, because “any delays” in getting low-income people online leaves them at a disadvantage. Worse still, this could indicate a bigger attack on the program. Pai claimed yesterday that broadband service will remain part of the Lifeline program as long as he’s chairman, but he has a history of saying the right thing and then doing the wrong thing. Phillip Berenbroick, Senior Policy Counsel at the internet advocacy group Public Knowledge, says opening a new proceeding on LifeLine could give Pai “an opening” to go after other aspects of the program. When Pai revoked the approvals for the first nine providers, the decision was widely criticized. He took to Medium to whine that the media had “sensationalized” the story, and that “based on the some of the coverage, one would think that we had ended Lifeline broadband subsidies altogether.” But he’s not doing anything to dissuade critics from the notion that he’s working to hold back broadband subsidies from the poor, or that he isn’t largely anti-consumer, given what he’s done so far to hold back net neutrality and internet privacy rules. He talks a big game, but actions speak louder than words.